Arthritis Consumer Experts (ACE) wants to find ways to serve you better with future JointHealth™ materials. In this December issue of JointHealth™ monthly, ACE is asking you to participate in various activities that will help us reach our goals. In return, we are offering various gift cards* as a reward for getting involved in some of the activities. In some cases, we may publish your written submissions. Most people take for granted all the things they do every day, like getting dressed, preparing meals, caring for children, driving, typing at a computer, exercising, shopping, and entertaining. People who live with arthritis, however, have to think about whether any of those activities will be too tiring, too difficult, or even impossible to do. Over time you may have come up with your own ways to get around some of your challenges. In honour of all those who are frustrated by uninspiring advice, ACE would like to dedicate a future JointHealth™ monthly to useful and even fun tips and tricks for going about your daily life. If you have ideas that are cheap, easy, less cumbersome, and add flare to daily life, tell us what they are. If you have found strategies to help you pace yourself, share them with us. Since you are the true experts of living with arthritis, we want to hear your ideas so that we can share them. Do you have simple and inexpensive tricks for doing things around the house? Have you found beautiful ways to accessorize your outfits that don’t involve buttons? What do you do everyday to make your life a little easier? Please contact ACE at feedback@jointhealth.org to provide your best tips. We will share them in a future issue of JointHealth™ monthly. Tip for the holidays: Prepare some food days or even weeks ahead of a party you are hosting. Vegetables could be chopped a day or two before and stored in the refrigerator. Side dishes could be cooked a few days ahead and frozen until the big day. Avoid freezing cream-based or cheesy dishes. Remember to take your casseroles out of the freezer the day before the party to allow them enough time to thaw so they cook evenly. Desserts, like cookies and bars, can be baked a month or so before. Tip for the kitchen: An easy to find item for opening jars is broccoli elastics. 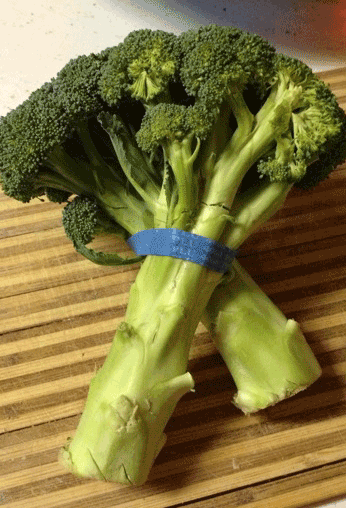 Any time you buy broccoli, it comes with a wide elastic band. Just wrap the band around the lid of the jar and now you have a lid that is much easier to grip and unscrew. Tip for the house: Lever door handles are recommended for those who have difficulty opening the standard, round door knob. If you want to avoid the cost and hassle of installing levers, you could put the broccoli elastic to another good use: place one around the door knob. Tip for the day-to-day: For the hand, simple things like having implements with wide, thick handles make gripping easier and put less pressure across the joints. Tip for traveling: Boat cruises can be a good option for people with mobility challenges. You can decide how many cities to stop off at, just about everything you need is on board, and you can stay active by swimming in the pool, walking around the jogging track or promenade deck, or exercising at the gym without even leaving the boat. Tip for the kitchen: Reorganize your kitchen with a little creativity and organization, your kitchen can be arranged to help protect your joints and conserve energy. Store frequently used items in cupboards between knee and shoulder height to eliminate unnecessary bending and reaching. Tip for inexpensive decorations: Dip pinecones in gold paint (either partially or all the way) or use a mixture of water, glue, and glitter for a sparkling effect. Place on side tables or use to fill baskets and bowls. Tip for winter gardening: Place poinsettias, and other blooming holiday plants, in bright light, away from drafts. Keep the soil evenly moist. Tip for falling asleep: Try to do the same things each night to tell your body it’s time to wind down. This might include taking a warm bath or shower, reading a book, or listening to soothing music — preferably with the lights dimmed. Relaxing activities can promote better sleep by easing the transition between wakefulness and drowsiness. What features would you like to see added to the JointHealth™ website? For instance, the site already has a list of arthritis books, but would you be interested in having those kinds of books reviewed? Would you like to see other types of books, including fiction, reviewed as well? Can you think of other ways the site could be improved to be more meaningful and engaging? If you have other ideas for the website or for topics in future JointHealth™ monthlies or expresses, please let us know at feedback@jointhealth.org. Book reviews and recommendations, please! Is there a book you read that helped you to understand your arthritis, cope with pain, or inspired you? Was the book so good, you think others like you would benefit from it? If so, let us know about it. ACE will share your recommendations in the resources section of the JointHealth™ website. Write a full review, and we will publish it on www.jointhealth.org and the Arthritis Broadcast Network (ABN). Feel free to send in as many book recommendations and reviews as you please to feedback@jointhealth.org. We are always looking for more contributors to share their personal arthritis stories on the Arthritis Broadcast Network (ABN). Whether you are newly diagnosed or have been living with arthritis for a lifetime, we want to hear about your experience of living with one or more of the over hundred types of the disease, and so do those who are a part of the ABN community. Your story is important, so matter how often you would like to contribute – once only or every week – it will help someone else feel less alone in their experience. There is more than one way to tell your arthritis story, so if you have other ways you express yourself, we would love to hear from you too. We will accept poetry and photos of your artwork or craft project. Please let us know if you would like to be an ongoing contributor. To qualify for a gift card your submission must be one of the first three received in a particular catagory and it must include your full name and address so that we can mail your card.